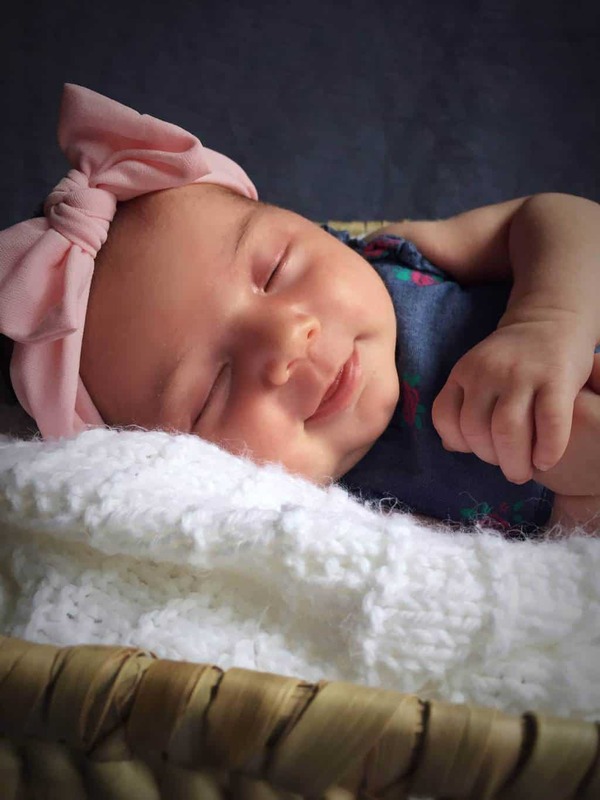 There’s nothing sweeter than a newborn photography…. unless you add an adorable older sibling to the mix! 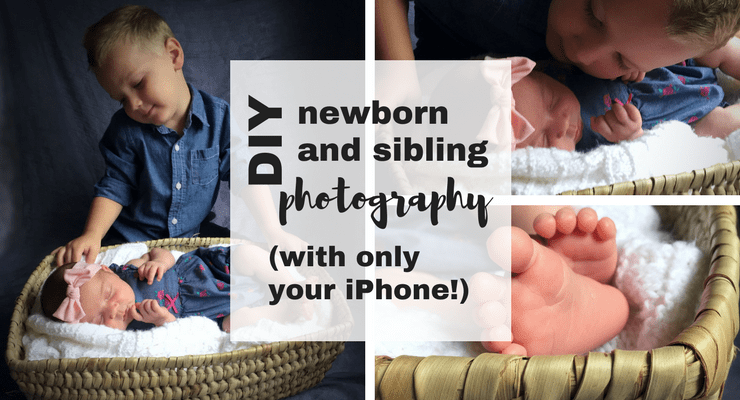 Take a peek at how I tackled a super sweet newborn and sibling photography shoot with nothing more than my iPhone. If you know me at all, you know I’m a bit of a cheapskate. I absolutely hate spending money on things that I can make or do myself. But sometimes I strike gold when it comes to DIY. And this newborn and sibling photography session is definitely one of those times! 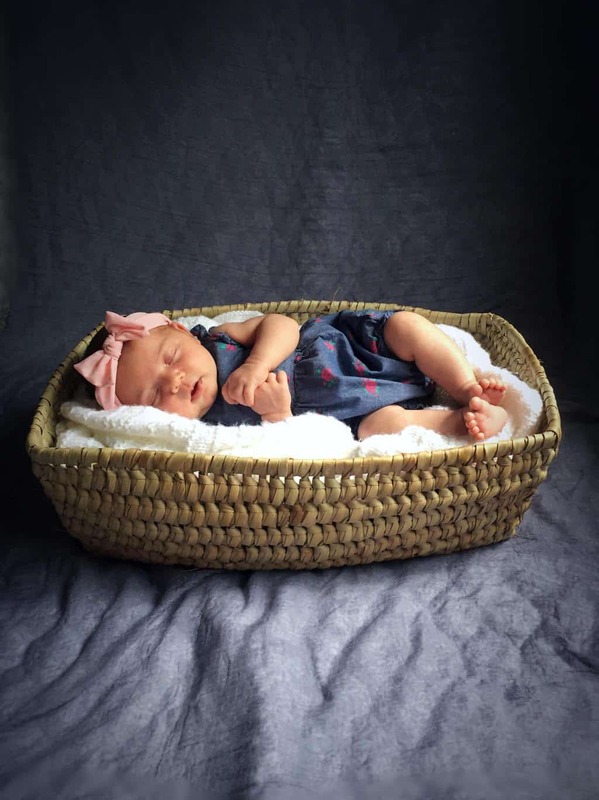 Disclaimer: This post contains affiliate links for products that will help you rock your newborn photoshoot! I only recommend products I know and love. 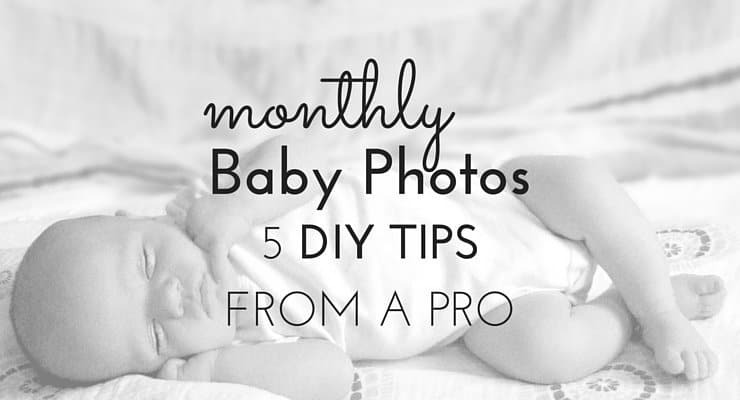 More Baby Photo Tips: Read my 5 best tips for drool-worthy DIY monthly baby photos! 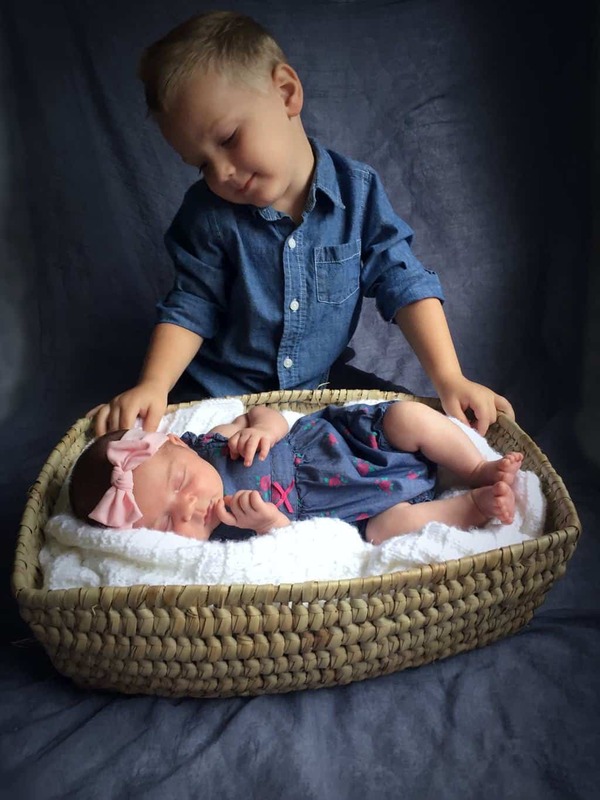 Time your newborn and sibling photoshoot in the mid-morning when the sunlight is bright but not glaring. Choose a room that has a big window and lots of natural light. Use your baby blankets to created a backdrop: Attach them at least waist high to a dresser or sturdy piece of furniture. (Please don’t attatch to chairs, they’re too easy to pull down onto your baby!) Pull out the blankets enough to provide a covered floor space as well. Repeat after me: Lighting is every-thang. 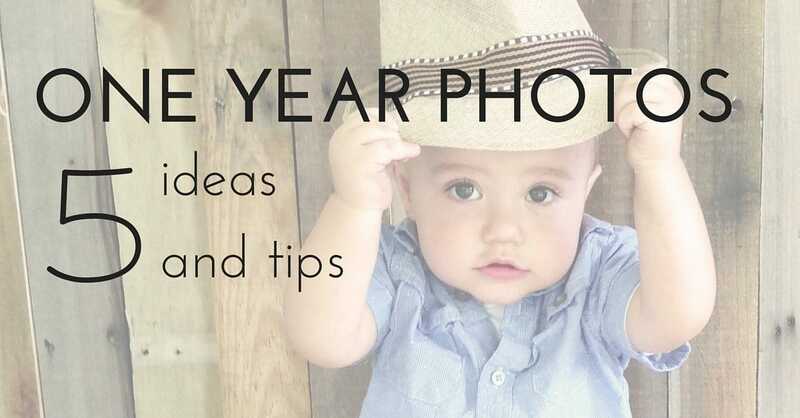 Get inspired for one year baby photos! 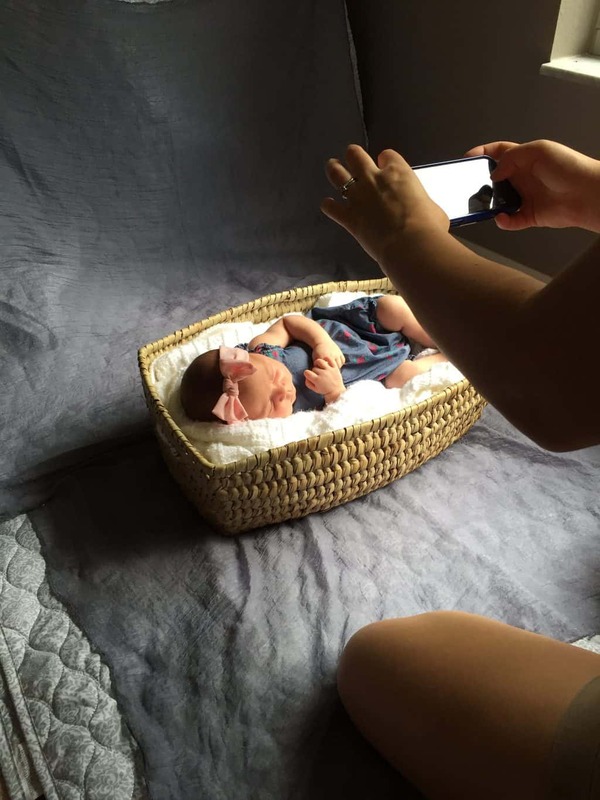 Tips and tricks for the 1st birthday photoshoot! Once you have your backdrop set up. Try out a few props and outfits. Hold different color and pattern combinations in front of your backdrop to help you decide which combos you like best. Baskets like these or these. Super soft and fuzzy blankets or rugs. Classic, not too trendy clothes for baby boys or baby girls. Coordinating, but not too matchy clothes for big brothers and big sisters. 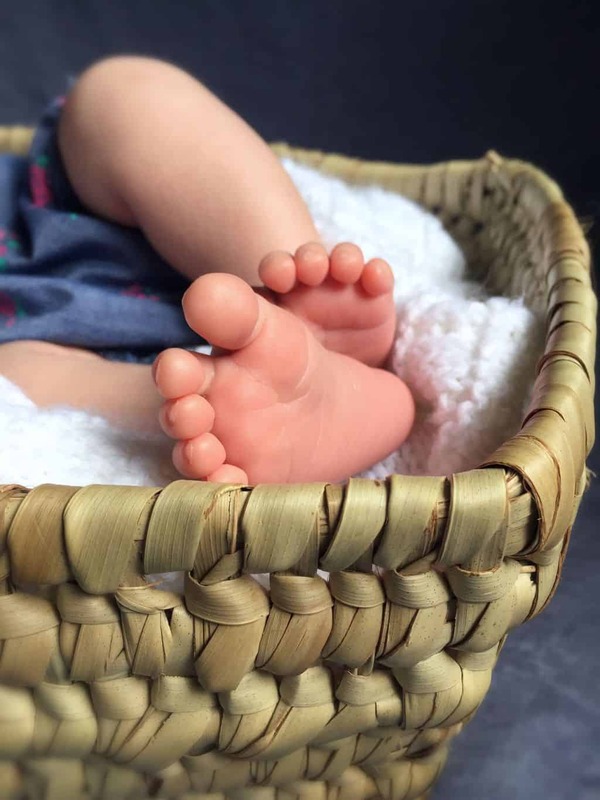 Try these poses for your newborn and sibling phototgraphy session! It helps to have an idea of the shots you want to capture, or even write down a list. Since you’re working with two kiddos you can’t count on more than a few minutes of happy, tear-free pictures. 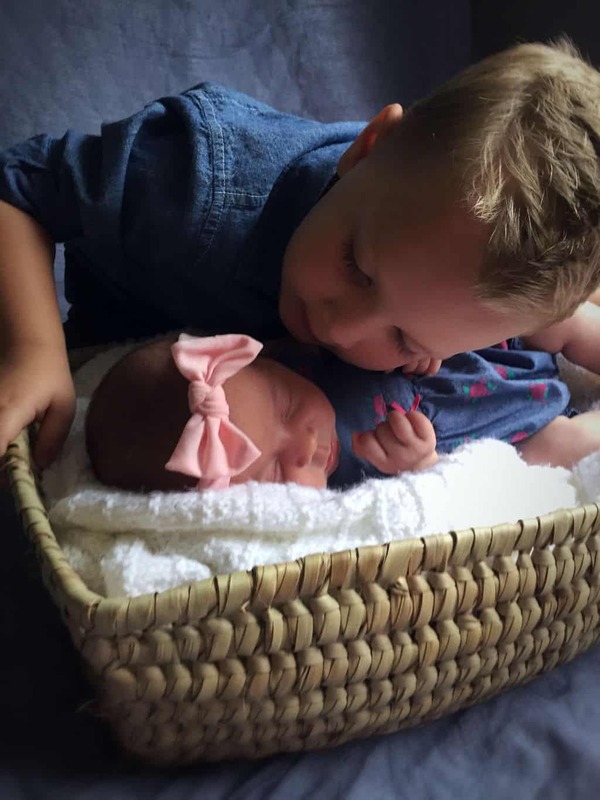 What worked for me was just letting my son love on his baby sis in his own way. He naturally wanted to kiss and cuddle her. I only stepped in and coached just a bit along the way. Just keep the camera focused and ready and you’ll capture tons of sweet moments. Steal my toddler and newborn daily schedule. A consistent routine will work wonders in helping you find the perfect tear-free photoshoot time! Big bro or sis looking down. Close ups of all those yummy baby toes! Baby cuddled in a basket. My favorite app to use for editing is Aviary. It’s free, (remember that whole cheapskate bit?) and it contains pretty much everything I want to do with my photos, right on my phone. For this photoshoot, I just increased the brightness and contrast a bit. I also adjusted the tint to bring a bit more of the blue tones out in these photos. Aviary has an awesome blur and focus feature so that you can create more depth in your photos. Perfection! I also like Aviary for the vignette feature. Your advice about lighting is everthing is so very true. Natural, soft light makes faces glow.